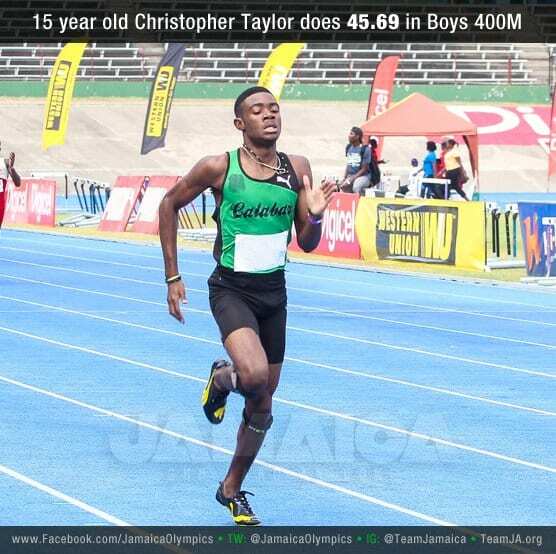 When Christopher Taylor ran the 400m in 48.72 last year at age 14, nobody really noticed because superstar Kirani James holds those records at age 14 and 15 with a 46.96 & 45.70 respectively. But this year (at age 15) when ran 45.69 easing down the last 20m, the whole world took notice. Christopher Taylor of Jamaica now joins the impressive list of 400 meter Olympic medallists including Luguelín Santos and 1988 OG winner Steve Lewis. Christopher Taylor does all the right things… runs a great 80m curve to start the race, then “floats” down the backstretch, conserving his arms like Roddie Haley back in my days. He puts a stronger effort on the 3rd 400m, where the race is usually won or lost. Finally, he digs deep over the last 100m, but he eases up at the last 20 meters. Grrr! In my mind, he runs a textbook 400 meters with the push-pace-position-pray formula of 400 meter racing. Read Michael Johnson’s racing strategy in the 400 meters. He should be like Lee Evans, where over those last 3 steps, it’s push-push-push-DIP for the line! Races are won and lost by inches. Or less. Sometimes 2 way ties. (If you haven’t read Lee Evan’s article from 1984, read Planning Training and Racing for Quality 400 Meters. A MUST READ! Also note the mechanics of his stride mechanics which differs from the first 300m, to the last 100m, something GB’s Iwan Thomas pointed out in his 2008 podcast. Take a look at the video below and watch the arm action and stride differences on the 2 straightaways. Read Ground Contact Time, Stride Length and Fatigue in the 400m and you will know why. And yes, he’s only 15 years old! Does he want to move to London?